One of the most powerful tools for photographers that has come about with digital photography is the histogram – that little graph you see on the LCD screen of your camera after you shoot an image. 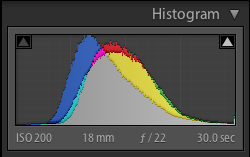 Yet many people don't know anything about the histogram. This is a huge oversight, as a histogram can be massively helpful in enabling you to take better images in almost any shooting situation. A histogram is simply a visual representation in graph form of the tonal information that your camera records when shooting an image. Histograms are actually quite easy to read once you know what you are looking at. The left side of the histogram represents the shadows and the right side represents the highlights. Memory Tip: If you cannot remember that, just think “black and white” – black is first, therefore on the left and white is second, therefore on the right. Thanks to David duChemin for that memory tip. The different colours in the images in this article represent the different tonal values. Therefore a high peak of one colour means you have a lot of that tonal value. If a peak is jammed up hard against one side of the graph or the other then it means that the camera has rendered the shadows as pure black (left side) or highlights as pure white (right side) – this is sometimes known as clipping. This is to be avoided if possible as it means you are losing detail in those areas. NOTE: The histogram on the back of your camera will be monochrome unlike the images below which are from post-processing software. Don't let that confuse you, as it's the shape we are trying to draw your attention to. Note: Often, only a part of the histogram will be up against the edge while the rest is more centered. Any part of the graph up against the edge indicates that some of the detail has been lost. If you are planning on doing post-production on your images in a program like Photoshop or GIMP, then you want to capture as much information as possible. The histogram can tell you whether you have done this or not – oftentimes much better than the LCD image itself. In general, it is better to “shoot to the right.” That means that you are ideally wanting to get a histogram that is predominantly on the right of the graph (without being pushed up against the edge). The image may even look overexposed on your camera LCD screen. The reason for this is that the highlights, which are represented on the right part of the histogram, capture a lot more information than shadows. If your histogram is to the right, then the image file is storing a much larger amount of information about that image than if the histogram is to the left. The right hand side of the histogram holds 90% of the raw data – the left side of the histogram only 10% – it is not an even spread. That means, if you “shoot to the right,” you have more information to work with when you get to Photoshop. In turn that means you can do more work on the image before you start to get the negative effects of noise and other undesirable outcomes. When are Histograms Less Important? If you don't plan on doing any post-production, then you are most often looking for a classic “bell curve” shape for you histogram. This generally indicates a good exposure with an even spread of highlights and shadows that will probably stand ok on its own. What Does This Mean for Shooting? If you are “shooting to the right” then that means getting more light into the camera (assuming your histogram is too far left). The easy way to do this is to overexpose the image by a stop or two. You might have a few problems when doing this when shooting very bright subjects. Use your judgment there, but remember that it can be easy to blow out too many pixels in such a situation, in which case you need to reign it in a little. If the histogram is crammed up against the right side, you're probably going too far. If you are printing your photographs, the histogram is something you will definitely be wanting to become familiar with (see our article on the best photo printer for more on that topic). All in all, using a histogram doesn't need to be rocket science. Once you are comfortable with it, you will probably use a histogram far more than the image on your LCD screen to judge the exposure of your images.